Category Archives: Creative Whisky Co. I received a sample of this Bowmore 11 in a swap with Michael K. of Diving for Pearls and after I received it I realized I already had an unopened bottle of it. 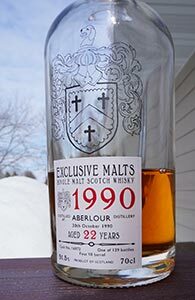 I finally opened it a few months ago for one of our local group’s tastings and we finished the rest of the bottle at our August tasting—I occasionally repeat bottles that were contentious in some way or the other to see if our responses might change as the whisky does with time and air. I’d planned to review it when the bottle had just been opened but didn’t get around to it because I read Michael’s review and wanted to forget about it before tasting—and then I forgot about the whisky completely. This review is of the last pour from the bottle, but please keep in mind that the evening before this had been at the halfway point—so it’s not a hugely oxidized pour that’s been sitting at the very bottom of the bottle for a long time (and the bottle itself was only open for less than five months). The run of reviews of smoky whiskies is threatening to become a run of reviews of Ledaig. 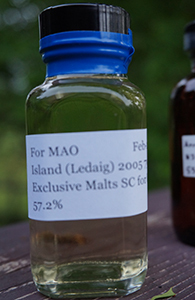 Well, this one from David Stirk’s Exclusive Malts at least doesn’t say Ledaig on the bottle. It says “Island Distillery” but it has all but explicitly been confirmed that this is a Ledaig. This was an exclusive bottling for my old pals at K&L. Let’s see what it does to my fairly positive streak with Ledaig. This is a bottle I brought back from Los Angeles this week. 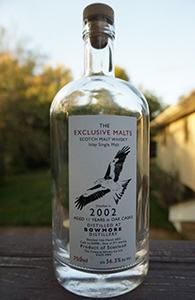 It was bottled by David Stirk (of the Creative Whisky Co.) in his Exclusive Malts line. I know David just a little bit from a whisky forum we are both members of. He is enthusiastic and likable–which I’m sure disposes me favourably towards his bottlings. 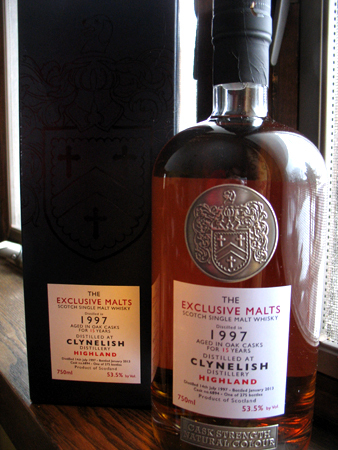 This Clynelish is one of nine of his bottlings that represent his entree to the American market. Hitherto, his bottlings have been available largely in the UK and the EU (though I believe he *may* be in the Japanese market as well) and there they are largely in the “good value” band of the pricing spectrum. Of course, with the three-tier system in the US (with importers, distributors and retailers all adding a healthy markup) that’s not quite as true here, at least not with this first consignment. As per David, this first lot of whiskies are being released only in California; and this Clynelish is retailing a little above $100. I got my bottle from Silver Lake Wine. David is apparently going to be running tastings of his whiskies at a number of LA stores in the coming weeks, including one at Silver Lake Wine, I believe, so if you’re in the LA area you might want to check him out. K&L is also carrying some of this initial consignment but not this Clynelish (presumably because they have their own exclusive cask of Clynelish of similar age and vintage from A.D. Rattray that this would compete with; if you have a bottle of that one and might be interested in swapping a sample from this one, let me know via the “Contact” page above).